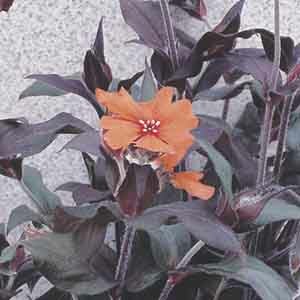 Orange-red blooms are set against striking purple-bronze foliage. The flowers attract hummingbirds to the garden. The blooms are followed by attractive seed pods. Makes a dependable mixed border plant. Combines beautifully with small ornamental grasses. Best planted in groups. Requires moist but well-drained soil. Benefits from light shade in hot locations. Pinch plants early in the season to form bushier plants and deadhead to extend flowering.